Railpictures.ca - Paul Santos Photo: EMD 645 power assembly (cylinder) that had a catastrophic failure neatly piled on a pallet. 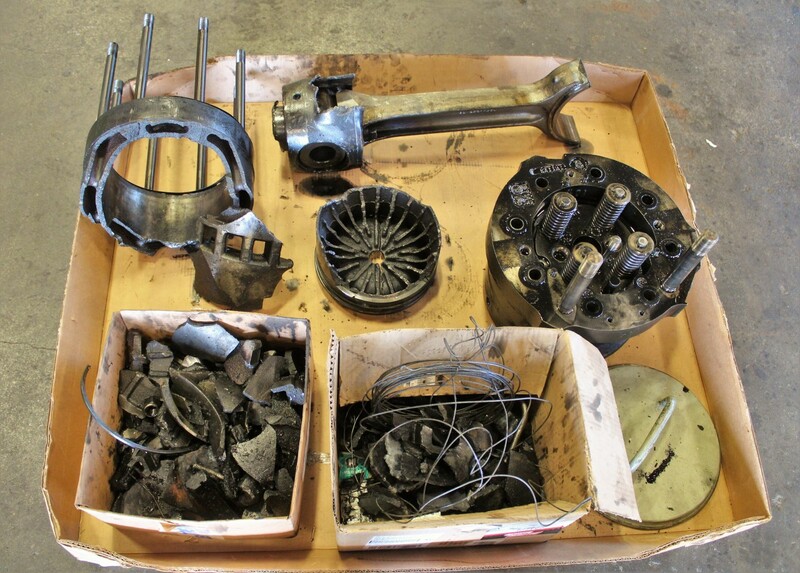 largest item is the cylinder head and the piston crown is shown just below the connecting rod. Various broken pieces sit in the 2 boxes (except for the bailing wire,that wasn’t in the engine:) | Railpictures.ca – Canadian Railway Photography – photographie ferroviaire Canadienne. This reminds me of the day back in 1977 coming home from Mirror, Alberta. As we left the yard and the tailend crew radioed they were all aboard, the hoghead widened out the throttle. Less than 2 minutes later our GP9 threw a rod and took out one of the inspection ports. Broken rod visible through the hole. The damage to the piston in your photo is quite amazing. Not much left of the exhaust ports either. Cool photo Paul. I like the fact that it’s all nice and neat. Usually, we throw things into boxes without a care in the world.